EPuffer is an international brand of electronic smoking equipment like electronic cigarettes, electronic pipes, electronic cigars, etc. The electronic pipes are one of their most premium products. The brand offers different varieties of electronic pipes to suit the taste of e smokers of different class. The ePuffer Electronic Pipe resembles a traditional smoking pipe in every possible way. This electronic pipe tastes, feels and looks exactly like a tobacco pipe but does not contain the disadvantages or harmful effects of the same. Smokers will enjoy similar smoking pleasure using the electronic pipes. The technology used in these pipes makes them superior than the traditional tobacco pipes. There is no flame involved in the electronic pipe. The device is run on the latest microelectronic technology. It is powered using a rechargeable small battery. The flavour comes from an exclusive safe cartridge that can be replaced when finished very easily. The cartridge actually contains water based flavour and propylene glycol that produces the smoke. Nicotine is present as per the choice of the smoker and tobacco flavour creates the taste of actual pipes. All this is present inside a membrane. During usage, the process of inhaling or vaping produces a similar satisfaction to actual smoking and even visible smoke (vapour) is generated which is vaporized mist of flavour. The 605 e-pipes are full sized electronic pipes from epuffer. It is of superior quality since it is a third generation product. It provides smokers a clean and better smoking alternative. The cartomizers are patent designs of the company. This ensures that smokers will get the same high quality taste for long time period. The pipes also contain a switch for manual mode. This should be kept pressed for more rich smoke and saves the battery power. There is flexibility to choose the nicotine content from no nicotine to 1.2 mg. The set of the pipe comes equipped with chargers, flavour cartridges, e liquids and batteries inside a wooden gift box. The 605 e-pipes are of two types; the reddish brown wooden pipe and the greenish marble pipe. Both the products cost £79.00. 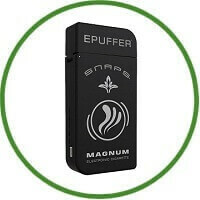 The epuffer mini electronic pipe along with the starter kit comes in four different styles and colours. They are: Walnut colour, White colour, Black colour and Burgundy colour. All the products have same price. This range is made for those who like to have a compact yet powerful pipe. It is best for people who want to quit smoking. The pipes are free from any carbon mono-oxide, tar or other cancer causing chemicals as in tobacco smoke. But it tastes same as tobacco. This device uses a 3.6 volt cylinder rechargeable lithium-ion battery which gives long smoking hours. Different flavours are available for the cartridge. This reddish coloured wooden pipe is a very popular epipe from the brand epuffer and the size is somewhat between the two above. When air flows through the pipe, a sensor detects the air flow and releases tiny droplets of flavour liquid producing a stream of vapour.